COPE Scotland’s one to one service in the West of Glasgow COPE, stands for Caring Over People’s Emotions. Caring about people and communities is core to what we do. But, no one service alone can set the worlds to rights any more than one person can UNLESS others recognise there is something they too identify with and want to get involved. Together we can make a difference. In the third sector and within communities there are many individuals, groups, and services working together with others including statutory partners to try and help create conditions where people suffer less and have a greater sense of wellbeing and security for them and their family, sometimes through the challenges people and communities face, which can seem overwhelming, when faced alone. Sending one wee postcard alone isn’t going to change the world. But maybe, one conversation about how we are kinder to each other leads to another conversation and before you know it, things have changed. If you’re a policy maker, do you have kindness as a core value? If when Universal Credit was being planned, the question, ‘’how kind is this new system going to be for people?’’ was asked, do we think it may have evolved differently? If you’re the Board of a company looking at your profit margins and you have people working for you who earn less than the living wage, do you think if the term Kindness was used in deciding people’s working conditions that may change? If we don’t dream of a world which is fair, where children don’t go to school hungry, where people have a sense of security there is a future worth holding on for, what do we dream of? 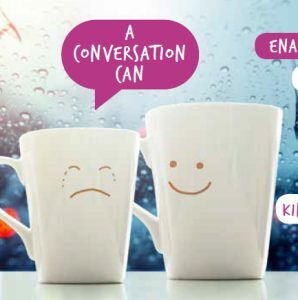 Kinder conversations is simply a wee idea, to start 5000 kinder conversations in homes, communities, schools, workplaces within policy making so kindness becomes part of the language of every day. Carnegie has been doing a lot of work around Kindness, really interesting piece. It is interesting also that Scotland’s National Performance Framework has Kindness and compassion as core values. We are fortunate we live in a country which cares and has kindness at its core, the wee Kinder cards are just another way to spread the word, people are not alone as others do care and that together we can build a kinder world where people suffer less.